So…I’ve been savoring a product that I received in my first ever Cuisine Cube (May 2014)…for good reason. You see…I love sweets. No surprise. I mean, I’m all about eating healthy and all that, but I believe treats are a welcome part of life. And without treating yourself every now and again, you will go insane and be no fun at all. This is why I believe in dessert after dinner. Moderation is key, of course, but…I think your day of eating should end with a treat, be it fruit, a piece of candy, ice cream, a cookie, a brownie, or a slice of cake. You’ve earned it. Even if it’s just a bite. Well…having just signed up for my monthly cube of gluten-free goodness, I wasn’t exactly sure what to expect. I, of course, had read about Cuisine Cube before actually choosing to sign up for the delivery service…but knew next to nothing about what would all be involved. What is involved is that, every month, a delicious box of gluten-free goodies arrives, spanning the entire spectrum of meals. One breakfast item, a snack item, a lunch item, a dinner item, a dessert item, and then…every now and again…a bonus. Yes…I am an athlete…but I’m also a real person…and I like candy as much as my 7 nieces and nephews do. However, when I had to go gluten-free three years ago…certain candies that I loved were now off the table, as it were. One such favorite treat was…Twizzlers. Not only did Twizzlers make mouths happy throughout my childhood and…yes…even my adult life…but I loved them. Simple flavored licorice (only the red…not a fan of black licorice at all! )…fat free…chewy…delicious. Something so simple and yet…so fundamentally iconic. Makes mouths happy, indeed. But…Celiac disease happened…and Twizzlers became only a fond, distant memory. Until…May 2014. Inside my Cuisine Cube that month was…this little pouch of little organic licorice twists. The brand was Candy Tree. I’d never heard of them before but now I wanted to marry them. Hey…sometimes it’s the little things in life that bring the most joy. I vowed I was going to eat them and relive all my Twizzler moments. I put them in my snack drawer…and thought about opening them on countless occasions and then…I just…didn’t want to. I didn’t want to fall in love with them and not be able to have them again. But, after not really wanting to make anything for dessert tonight, and not feeling cookies (shock! )…I wanted something light. And, then I remembered the licorice twists in my drawer. The package held two servings…perfect for my roommate and I to split between us. Candy Tree was actually founded in 1984 by two parents who were concerned with what their seven children were eating. They began to cook up lollipops, toffees, licorice and hard candies, all made with organic ingredients and using an organic corn malt as a base. They then would flavor these treats with real fruit and organic apple juice. These treats are made in Holland, with strict precautions being taken so that there is no gluten contamination. So…you are literally getting something to satisfy your licorice craving without all the bad stuff. And…tonight…I opened up the little plastic pouch and split the Candy Tree Organic Raspberry Licorice Twists between myself and my roomie. Moment of truth. I don’t remember much about Twizzlers, as it has been three years since I’ve had them…but I do remember them being really soft and chewy. 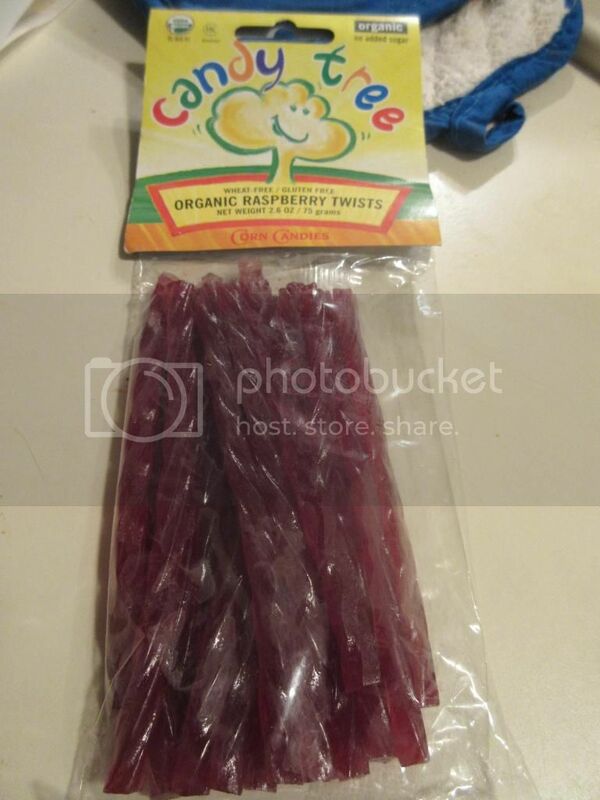 The Candy Tree Organic Raspberry Licorice Twists…are not as soft and chewy. My roommate, who literally just had Twizzlers on Friday, said the same thing. They are a little tougher than licorice twists she’s used to…but the flavor was amazing. You would be hard pressed to believe that these organic licorice twists have no added sugar at all. None. Everything comes from the real fruits and fruit juices that help to create these. While these were a little tougher than I normally would like licorice…I just want to say…I WAS EATING LICORICE!! So, I didn’t care that they had a little bite to them. They were packed with great flavor and they were sweet without being over-the-top sugary sweet. In fact…I ate through my serving in what is probably record time. You try not having something you love for three years and then having something that is the gluten-free equivalent in your grasp and see how long it lasts. HA! So, let’s discuss what the Candy Tree Organic Raspberry Twists are actually made from, shall we? 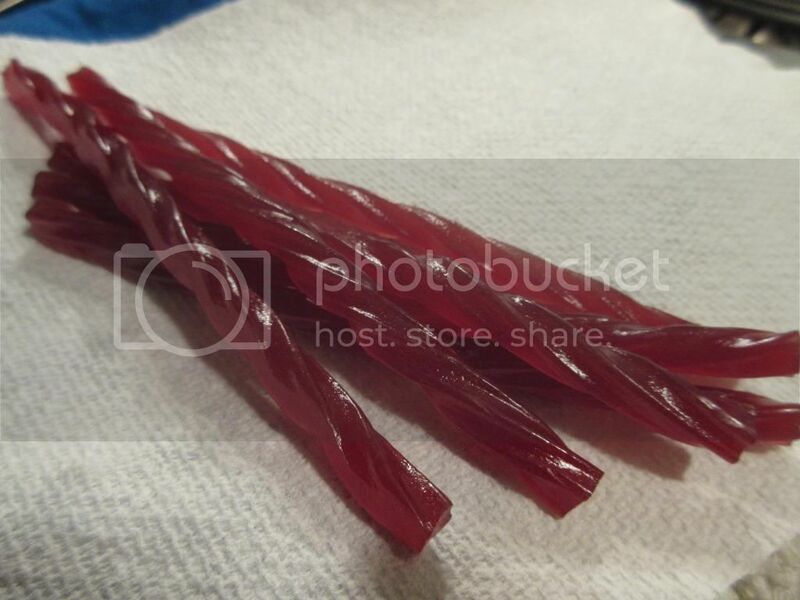 These licorice twists are made with organic corn syrup, organic rice flour, organic rice starch, organic apple juice, organic concentrated fruit juice: raspberry (3%), organic flavor: raspberry, citric acid. This product is gluten-free, wheat-free, milk/casein free, soy free, and organic. As far as nutrition goes, a serving size of the Candy Tree Organic Raspberry Twists is 40 grams (or 1/2 of the package). There are two servings per package. A serving will provide you with 140 calories. These are completely fat free. One serving also will give you 19 grams of your daily sugar intake. A serving has no fiber and only 1 gram of protein. So, it isn’t filling. It’s candy. A treat. Enjoy it. So…while they weren’t the highly processed (thank goodness!) Twizzlers I grew up eating, they were very delicious. It was a very nice throwback to a candy I used to devour at every waking moment. These were a great, organic, no sugar-added treat that I would be more than happy to eat all over again. Thank you, Cuisine Cube, for introducing this fantastic candy treat to me. This entry was posted in Candy, Cuisine Cube, Dessert, Food, Fruit, Gluten-Free, Products, Review, Snacks, Sweet Stuff, Vegan, Vegetarian by The Celiathlete. Bookmark the permalink.